Lorenzo Cifonelli made me this beautiful suit at the beginning of the year, and I’ve meaning to write about it ever since. He has cut two jackets for me in the past, a pale-grey cashmere DB and a green tweed SB. I gave details about both of them at the time, and you can see them at those links. However, I thought it was worth going into a little more detail here, particularly given reaction from some of my favourite tailors to this 11oz three-piece. In the words of one cutter, Cifonelli uses an extravagant amount of handwork in its suits. I think extravagance is the right word. I offer no justification for it from a practical point of view – it is pure aesthetics. The waistcoat, for example, is handsewn and then top stitched around the collar and the armhole; even the bottom of the lining, where it joins the cloth, is handsewn, which is completely unnecessary. Indeed, it is harder to achieve the straight line required when sewing by hand – Cifonelli’s is, of course, straight, but it will have taken an hour or more to do that one seam. I will post more close-up photos of these aspects next week. It is easy to focus too much on the construction, however, for the fit and styling are also superb. No flat-fronted pair of trousers I have fits so cleanly down the fronts. 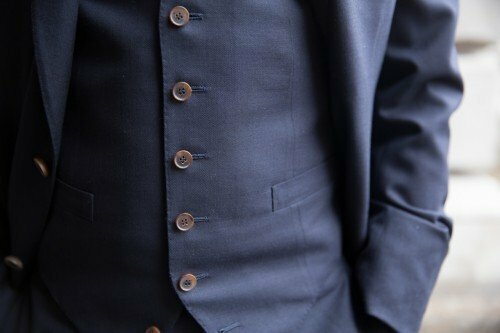 The waistcoat uses two darts in the front – one only under the pocket – to shape it into the front of those trousers. As a result it sits clean and flat against the trousers where others often stand away. Among style points, the roping of the shoulder and broader lapel give a great plunging-V to the jacket, without resorting to the drape or heavier canvas of English tailors. The buttons are a chunky brown horn – probably the only showy thing about the suit – that I love. I always find it funny when English tailors tell you the horn buttons they have are the only ones on the market. They haven’t spent any time looking. At over €5000, this is an extravagant suit in many ways. But it is also one of the most beautiful things I have ever worn and many other tailors could learn from the style points as well as the construction. 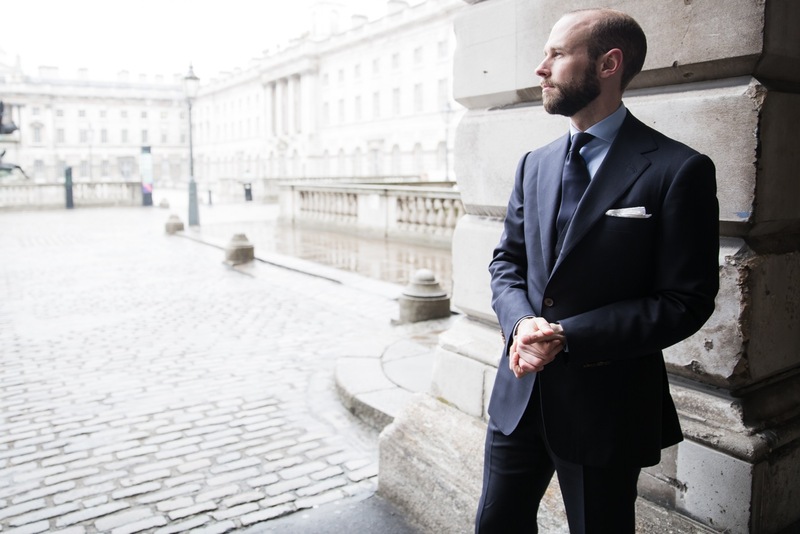 You can follow the discussion on Cifonelli navy suit by entering your email address in the box below. You will then receive an email every time a new comment is added. These will also contain a link to a page where you can stop the alerts, and remove all of your related data from the site. Absolutely stunning. Looking forward to more pictures. I agree. It really is stunning how one man obtains his clothing, shoes and accessories. Brilliant suit, as always. Thinking of your entire wardrobe, what do you consider your favourite, or ‘go to’ suit? I own a gray, nailhead A&S three piece and a charcoal Huntsman that seem to travel with me wherever I go. This is truly a beautiful suit and I can understand the infatuation with all this handwork. The suit fits you quite well but I have a small question for you regarding the vertical line on your left shoulder one can see in the first two pictures. Were you wearing a bag or is this due to the padding underneath? Also, but this is purely a matter of taste, canvassing and, as you point out, fabric, in the second picture of your breast pocket, one can see how the chest just above the handkerchief billows inside. This jacket not being of Neapolitan construction, is this due to the tension from the handkerchief? Very detailed, I know, but such handwork precision also merits a closer look at other details. Of course, the fit and comfort, in my opinion the most important factors, can never be conveyed through a photograph, thus all the above remarks become obsolete in the light of “the” perfect fit. Thanks for the comments, and I agree that it merits close analysis of the fit. But I don’t think that’s ever possible with photos. Too much depends on light, contrast, stance… I’ve seen great-fitting suits look terrible in such photos, and vice versa. They have to be merely illustrative I’m afraid. Thank you Simon and agreed! So how about that line, or is it a crease from traveling? No idea. It’s not there now though.. I must say I find the ironing work on the suit is great. Looking at the close up of the waist-coat you can see that the dart seems are rasor sharp and the pockets are very flat and sharp. This type of ironing work can only be done during the sewing after each single step. It is quite time consuming but I love the result. And a great pick Simon! really really delightful. much more of a permanent style that your title advertises than some of the more louche items that sometimes pop up…. Simon- beautiful lines and construction on the Cifonelli suit. Your shirt collar is also beautifully cut. Can you tell me who made the shirt? Thanks Rick. It was Satriano Cinque. Beautiful beautiful suit, one that does justice to your elegance Simon! Just curious, besides the strong shoulders/lapels, is there anything else that you would say is distinctive of Cifonelli’s house style? Something that would distinguish it from the row? Thanks David. The distinctive thing is the way that strength is achieved without very much padding, so it is still a soft jacket, then the superb level of finishing and the inventiveness of Lorenzo’s designs. Have a search through previous posts for some examples of that! Beautiful suit Simon, and I love the combination of light blue shirt, navy tie, and navy suit. Very elegant, tasteful, and classic. Does the suit have a pagoda shoulder, which Cifonelli sometimes uses, or another type of shoulder design? Cifonelli supplied them. Lorenzo has a thing for interesting buttons. Yes, the Neapolitans do like their shiny horn..
Amazing! It worth the price!! Simon, this is an absolutely fantastic commission. Would you mind telling us a little more about the cloth? Could you give me some information on the cloth please? It is a 9oz worsted, plain weave. Do you know current pricing for Cifonelli? Given that this article is 2.5 years old and SR prices seem to have gone up more than 40% since then, I would imagine an equivalent Cifonelli three piece would be considerably more than €5000 today? i have made suits with ciffonelli but honestly not a perfect suit. the suits are ok with the button open but closed. they are tight in the back area and wrinkles do show up. can you show more pics on your blue suit (back area).?? i travelled all the way from Latinamerica 3 times , very expensive and not perfect. For me has been dissapointing. Yes i did. They are going to re-fit the suits again . But my expectations were high having MTM before, and now investing into bespoke and besides travelling from so far. i think bespoke demands a lot of time on site to make it really perfect… between appointments , fittings and adjustments…..
Are Cifonelli’s notch lapels “fish mouth” like you see some other French tailors cut, Simon? Have you had any experience will Cifonelli RTW? I’m looking to get a new suit and upgrade from my existing Canali RTW. I’m tossing up between Thom Sweeney, Tom Ford and Cifonelli. I’ve decided on RTW as I’m based in Australia and I’d be purchasing online. What would be your recommendation of the three if any? Can you please post more pictures of this suit? A post on your navy business suits would be incredibly helpful, especially for those that want inspiration commissioning their navy business suits. As would a post on the various parts of a suit and how differences affect the overall piece (some of this information can be found scattered in several of your posts.) Can you do a post on suit and trouser linings (eg. silk charmeuse v bemberg, etc.)? Personally I am building a uniform wardrobe with navy suits in different fabrics. I am thinking of starting with a 12-13 oz high-twist, something that can take a beating year round. Any specific fabric recommendations? Also, have you considered a dupioni silk suit? I know these are a lot of questions. As always, thank you so much for taking the time to answer them! Hey Jay. Some big questions there that, as you point out, are probably better for full posts. – I actually don’t have many navy business suits, only Cifonelli and Whitcomb & Shaftesbury, plus an old Timothy Everest one. The other navys are too flamboyant for the office (eg Chittleborough). I know that you usually have cuffs on odd trousers. But do you usually have it on worsted suits?